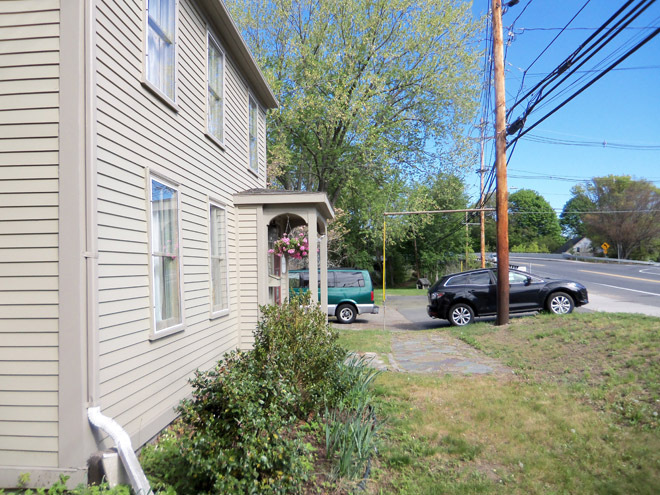 This dwelling began as a half house, two rooms in depth, and appears to have been constructed about 1735 for Margaret Dow and her second husband John Lull. The principal room retains its cased frame, and a fine paneled fireplace wall. The rear room fireplace has been reduced in size, but vestiges of an early lintel remain. Additions date to the 19th Century. The site of this house was owned by Thomas Smith, a shoemaker, as early as 1638. He sold it to Thomas Dow in 1676 (4:83), who with his brother Jeremiah built a house on the lot. Jeremiah Dow’s widow Susanna and her daughter Margaret, also a widow, retained ownership of the property. Margaret married John Lull and the house was apparently been built for them. Town Record inform us that John Lull and ‘the widow’ Margaret Greenleaf ” both of Ipswich, were published the 8th of December, 1733. Deeds of the adjoining property mention John Lull as the owner of this estate, and that it came to him by his wife. 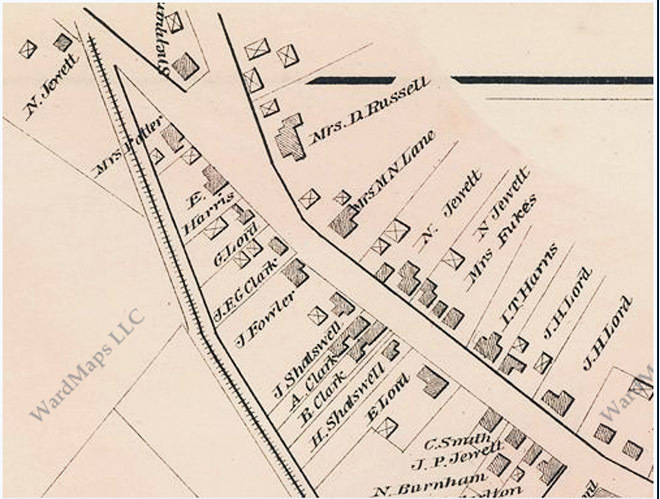 The 1832 “Philander” Ipswich Village map shows the name on this house as “Ebenezer Harris,” and “E. 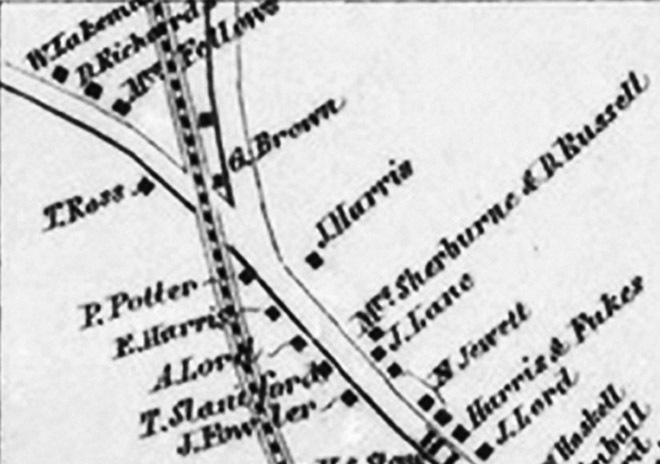 Harris” is shown on subsequent maps through 1884. The Dow-Harris house has been used as a single-family residence, and as the Ascension Memorial Episcopal Church parsonage, and is now the home of Blaine and Maria Hebbel. “Thomas Smith, shoemaker, sold his acre and a half lot to Thomas Dow, a soldier under Major Appleton and wounded in the Great Swamp Fight, March 9, 1676-7. In his deed of Feb. 4, 1691, Thomas Dow states that his brother Jeremiah, was associated with himself in the purchase of the lot, that they built the dwelling together, and that he conveys his interest to his brother. It was bounded by Caleb Kimball and John Day. 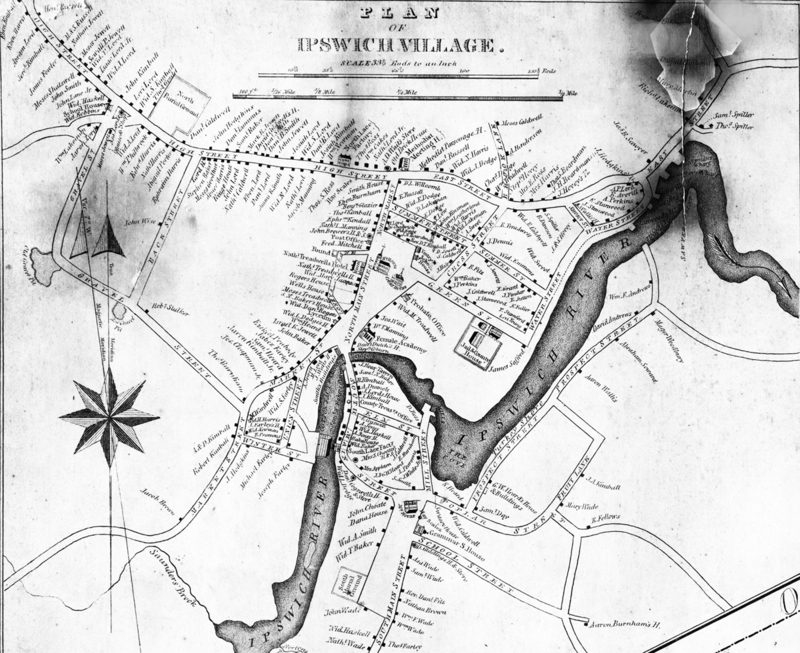 “But all other ways doth adjoin (as it is also bounded) by the said Ipswich Common.” Jeremiah’s will, probated June, 1723 gave a yearly stipend of £4 a year to his widow provided she relinquished her claim upon the estate, and gave the real estate to his only child, Margaret, not yet eighteen years old. Margaret made an early marriage and on Nov. 2, 1727, Henry Greenleaf, her husband, and Margaret, sold the homestead to Benjamin Dutch (who was an Ipswich real estate trader) “bounded northwest partly on the Town’s Pasture and partly upon a highway to sd. Pasture. Dutch sold it to her mother, the widow Susanna Dow, Jan. 3, 1728. Susanna Dow’s will mentions her Daughter, Margaret Lull. The Town Record informs us that John Lull and “the widow Margaret Greenleaf ” both of Ipswich, were published the 8th of December, 1733. Deeds of the adjoining property mention John Lull as the owner of this estate, and it came to him by his wife. Read about the Lull family in Ipswich. 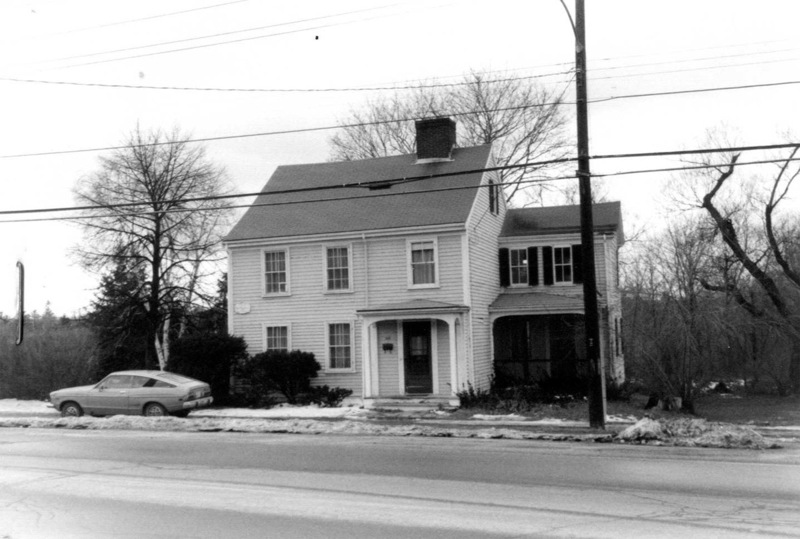 The Dow-Harris house in 1980. 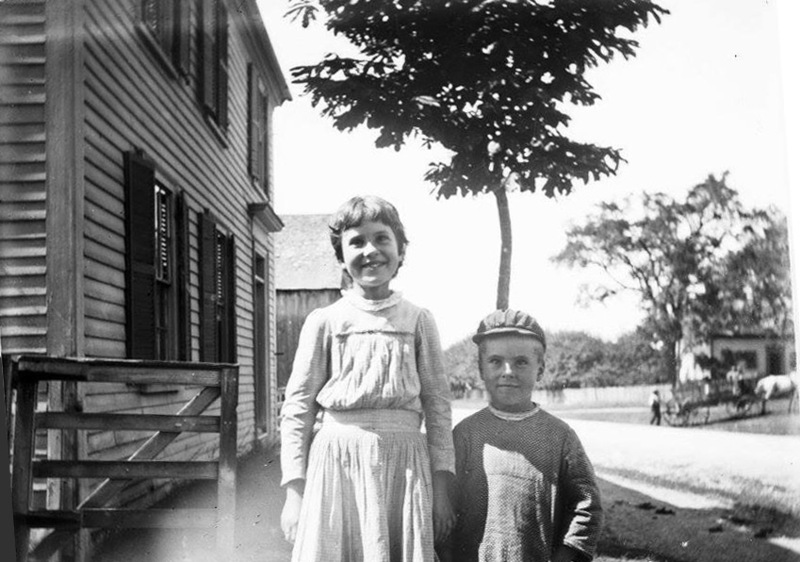 This photo is the front of the Dow-Harris house, and may be the children of Thomas Franklin Waters. The horse-drawn wagon is in front of the vegetable and fruit stand that was for many years located at the intersection of Town Farm Rd. and High Street. Photo courtesy Ipswich Museum. The same view today. Before the bridge over the tracks was constructed in 1900, High Street continued straight. The old road still exists and serves as the driveway to the John Kimball Jr. house, beyond the parked vehicles in this photo. The stone foundation for the barn in the older photo still exists as well, providing an attractive border for the yard. Thomas Franklin Waters notes that Ebenezer Harris, whose name is associated with this house, was among Ipswich persons who donated to a fund to aid the families of soldiers who were away during the Civil War. The Harris family memorial is at the Old North Burying Ground, location H-54. Ebenezer Harris born Oct 1, 1803, died Dec 27, 1885. His wife Joanna Harris, was born May 23, 1798, died June 26, 1878. Their son George served in the Civil War He was born June 8, 1835 and died Dec 31, 1912. His wife Susan Todd of Rowley, was born Mar 20, 1850, and died Sept 25, 1920. The children of George Harris and Susan Todd are listed in the family grave. Robert C. Harris (1885 – 1904). He died as a student, a suicide by gunshot. With this information, one can speculate that the photo may have been taken by the owner of the home, George Harris, who is listed as a member of the Ipswich Historical Society in its early years, at least through 1899. He donated various items, including a chair and a book. These may be two of his children in the photo, Lucy G. Harris and Robert Harris, and the date of the photo would be the early 1890’s, but this is highly conjectural. Lucy G. Harris graduated from Manning High School in 1896. I am seeking information related to the use of this house as the Episcopal rectory. 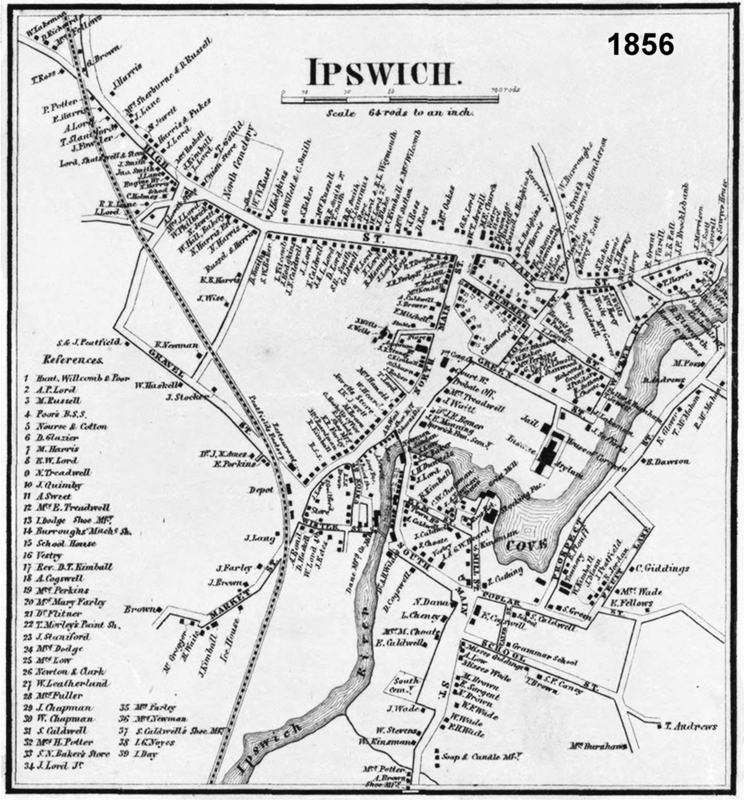 In the year 1905 when Waters was writing Volume 1, he notes that the Episcopal rectory is in the house known as the “John Gaines house” on High St.
1872 Ipswich map showing the intersection of High St. and Town Farm Rd. The Dow-Harris house is indicated on the left, and a small building owned by John Dorr is shown in the intersection with Town Farm Rd. 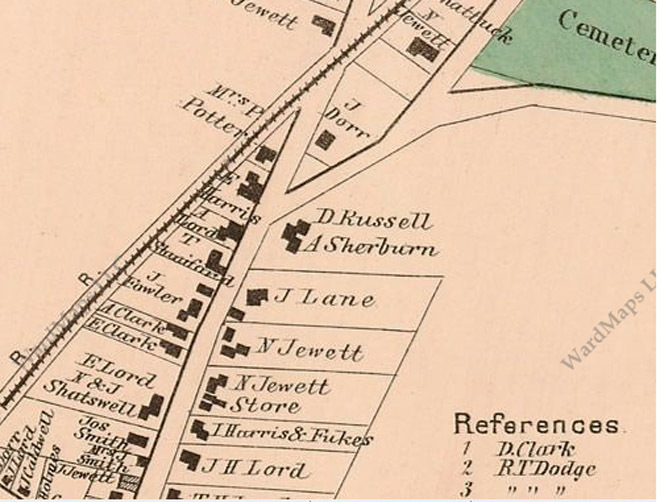 The 1884 map shows a barn or shed (indicated by an X) beside the Dow-Harris house in the same position as the photo of the children. Shepman’s farm stand is at the intersection with Town Farm Rd. T.F. Waters, Ipswich in the Mass. Bay Colony, vol. I, pp. 369-370.